The opposite of Faith is not Doubt, it is Fear. Delivered and recorded LIVE at the Armenian Church Youth Ministries Center, Glendale, 1 August 2010. Sermon on Matthew 19 – It’s much more about separation of the Heart from the Mind. 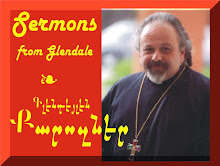 Delivered and recorded LIVE at the Armenian Church Youth Ministries Center, Glendale, 25 July 2010.